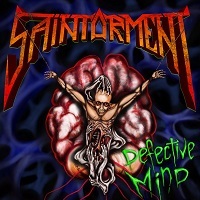 SAINTORMENT is a thrash metal band from Latvia. They were formed in 2013 and started out as a cover band that played METALLICA, KREATOR, PANTERA, and EXODUS songs. “Defective Mind” is the follow up to their 2015 release “Well of Sins”. As you listen to the album you can tell the bands that make up their influences in their sound. “Physical Force” starts the album out with audio pulled from Robocop the movie when ED209 is about to gun down the corporate flunky in the board room. The song goes from this into heavy fast riffs that you would expect from a good thrash metal song. The music is good and has that bang your head quality. The vocals I am not a fan of, they seem rushed and don’t meld with the song as well as I would like. “We Are” has a nice drum beat to start the song out. The guitars come in and the song takes off. It’s a more subdued song. The vocals are better on this song because they don’t feel so rushed to keep up with a faster song. Overall the track is a very solid song, veering more towards straight up rock than thrash. By the time I get to “Never” I am loving the musical arrangements of the songs. The vocals have been hit and miss through the album. In this song I enjoy the vocals the most because they are really subdued and go along with the song better. However, I still am not completely sold on the vocals. The music on this track is my favorite of the album. “Mood Pyrexia” comes out swinging with solid thrash guitars and a steady drum beat, before slowing it down and letting the music marinate around you. Again, the band is top notch on the musical spectrum. You get to really feel it in this song since it is devoid of vocals. They put out what they can do on this track and it pays off. I could listen to an entire album of just them wailing. “Ai, ka man patik” is a fast, balls to the wall song right out of the gate. The heavy drum blasts are met with vocals trying to keep pace. This is a fun song that isn’t trying to take itself seriously. Even though the vocals are unknown to me I enjoyed them on this song because they didn’t feel as forced as other tracks. Overall, it’s a fun light-hearted song to head bang to. “Defective Mind” is a mixed bag for me because I thoroughly enjoyed the music on the album, but I was not a fan of the vocals. Many times, it seemed forced and out of place against the music. Sometimes the vocals melded well but it was few and far between. I would be interested to see what this band does in the future. With more cleaned up vocals this could have been a stellar album.